A cross over toe describes a condition where a toe(s) become buckled, contracted or crooked – then literally crossed over another toe. The 2nd toe is, by far, the most common to cross over toe, though any toe could be involved. The 2nd toe will cross over the big toe, and this can happen with bunion problems. In short, a cross over toe occurs from damage to ligaments supporting a toe, causing a muscle imbalance – leading to slow dislocation and crossing over of the toe. Patients with a cross over toe may develop pain in the entire digit, on the top of the toe, tip of the toe, and/or on the ball of the foot. Excessive pressure from shoes may result in the formation of a hardened portion of skin (corn or callus) on the knuckle and/or ball of the foot. The toe(s) may become irritated, red, warm, and/or swollen. The pain may be dull and mild or severe and sharp. Pain is often made worse by shoes, especially shoes that crowd the toes. 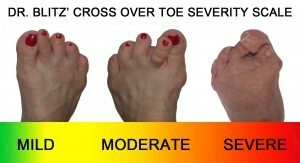 While some cross over toes may result in significant pain, others may not be painful at all. Painful toes and the bulk of the toe grossing over can prevent you from wearing stylish shoes, or shoes at all. Toe deformities (contractures) come in varying degrees of severity – from slight to severe. The can be present in conjunction with a bunion, and develop onto a severe disfiguring foot deformity. Advanced cases, the toe can dislocate on top of the foot. Depending on your overall health, symptoms and severity of the cross over toe, the condition may be treated conservatively and/or with surgery. • Injections: Cortisone injections are strong anti-inflammatory agents to decrease pain, and swelling directly at the toe region. Injections only treat the symptoms, and in some cases used in caution (and sparingly) they can further weaken supporting ligaments of the toe(s). How Is A Cross Over Toe Surgically Corrected? The basis for cross over toe surgery most often involves removing s portion of bone within the toe itself, to reduce the joint contracture. The toe will also need to be relocated at the joint of the ball of the foot, and in some cases bunion surgery to make ‘room’ for the relocated toe. The first thing to repair a cross over toe is to repair the buckled digit. There are generally two methods surgeons use to correct the contractures – they are joint resection (arthroplasty) or bone mending (fusion), and the location where this is performed on the toe depends on where the toe is buckled. The second aspect of a cross over toe surgery is to perform a joint relocation procedure, which is performed at the joint of the ball of the foot. Dr. Blitz performs a series of ligament releases and repairs to get the joint realigned. Occasionally, the ligament on the bottom of the foot will need to be repaired (called plantar plate tear surgery). When the toe is severely dislocated, a bone shortening procedure will be needed to get the back into place. Nonetheless, a surgical wire is inserted to hold the toe stable and steady during the healing process. The third part of a cross over toe surgery is to correct a bunion problem of the big toe. Dr. Blitz recommends bunion surgery when the cross over toe has “jumped” on top of the big toe and/or there is too much flexibility of the bunion region which causes instability of the front of the foot – causing the cross over toe in the first place. Its important to recognize that most of the surgical work involved the joints of the toe, not the joint of the ball of the foot. Sometimes a toe relocation procedure is needed when the joint of the ball of the foot is malaligned (subluxed or dislocated). Recovery after cross over surgery depends on the method of surgery performed, and the extent of any bone surgery performed (if any). In all cases, healing takes about 6 weeks in healthy people and there is no way to speed up that process. Patients often return to normal activities and shoe gear by 6 weeks to 3 months depending on just how severe the toe deformity was preoperatively. Simple toe surgery can recover very quickly, and return to a shoe in two weeks. More complex repair, where bunion surgery is also performed, recovery is usually 6 to 8 weeks, then return to normal shoe gear. Factors that may prolong healing are age, smoking, poor nutritional status, and some medical problems. Walking after cross over toe surgery is strongly dependent on the method (procedure) surgeons choose to correct the toe and the techniques used to stabilize the digit while mending. Nearly all of Dr. Blitz’ patients are walking immediately after cross over toe surgery regardless of whether or not bunion surgery was also performed. Because of Dr. Blitz’ advanced Bunionplasty® procedure techniques he is able to weightbear a very larger majority of the bunions (regardless of severity). Toe surgery is performed as outpatient surgery (this means you go home the same day). It may be performed in a hospital, ambulatory surgery center and even in the doctors office (so long as the facility is set up for surgery). Is Hardware Implanted Into The Foot With Cross Over Toe Surgery? The use of surgical hardware for cross over toe surgery is very common, and depends on the severity. Surgical hardware may involve stainless steel wires, screws, synthetic material, absorbable pins, cadaveric bone, and/or specialty fixation devices. A temporary stainless steel rod is most commonly used to hold the bones steady. The rod (medically known as a K-wire) will stick out the tip of the toe and removed in the office once healed – 2 -6 weeks later. Removing of the rod is doesn’t elicit pain usually, rather just an uncomfortable feeling. When corns and calluses (dried skin buildup) is present along with a cross over toe, indicates that the buckled toe is rubbing against the shoe. In general, correcting the toe problem will also correct the corn/callus buildup. In most cases, Dr. Blitz excised the corns are part of the incision approach for a better cosmetic appearance of the foot after toe surgery. There are general risks associated with cross over toe surgery (or any surgery) and the use of anesthesia. Complications may occur and are not necessarily your fault, or the fault of your surgeon. Nonetheless, you should understand the risks.